Lassis are energising drinks for summer. They can quench your thirst and hunger and is ideal as a healthy drink for hot summer if your digestion is good. Lassis come in all flavors like salty, sweet, mint, etc. 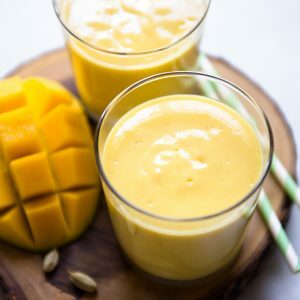 Mango lassi is yogurt based mango smoothie. Prefer to use cubes of fresh mango, however canned mango can also serve the purpose. Ground cardamom sprinkled on top is perfect for this lassi. Blend mango, yogurt, honey and cardamom in a blender for 2 minutes. You may add ice if you prefer. Sprinkle a pinch of ground cardamom to taste. Lassi is ready to serve. 1. You may use ripe or raw mango. Ripe one gives the golden sweet lassi where as raw one, sour greenish lassi. Golden lassi suits with many people, however green lassi may not go well with many health wise if used regularly. 2. Use ice only if necessary. 3. You may adjust the consistency of the lassi by varying the quantity of yogurt and mango.